In this photo dated March 19, 2011 Libyan Foreign Minister Mussa Kussa speaks during a press conference in Tripoli. Kussa arrived in Britain on March 30, 2011, telling the British government that he was resigning from his post. In a thundering blow to Muammar Gaddafi's standing and the morale of his regime, Libya's Foreign Minister Moussa Kusa defected to London on Wednesday night, in the regime's most high-profile break since the Western bombing campaign began nearly two weeks ago—if not, indeed, the most momentous split in the Libyan government in years. Kusa, who has long been one of Gaddafi's most trusted aides, landed at London's Farnborough Airport at about 9 p.m., after slipping across Libya's border into Tunisia earlier this week. He was flown on a British military jet, and immediately requested political asylum. "Kusa is not happy about how the government has handled the conflict," said his friend, Noman Benotman, a former leader of the Libyan Islamic Fighting Group, which was aligned with al-Qaeda until 2008, speaking to TIME late Wednesday night. Benotman said Kusa revealed earlier this month that he was distressed that Gaddafi had once again turned Libya into a pariah state, after years of Kusa's careful work in restoring its standing in the U.S. and Europe. "He was the key figure to rehabilitate Libya with the international community," Benotman said by phone. "Now it is all gone." Kusa's defection comes just one day after Western and Arab leaders met in London for a key coalition meeting to decide the next steps in their campaign against Gaddafi. There, U.S. Secretary of State Hillary Clinton and other leaders warned Gaddafi that his time in power was quickly running out, and invited those around him to ditch the regime before it was too late. Kusa appears to have been the first to flee — but Benotman says he is unlikely to be the last. "I'm aware of dozens of people in Tripoli who are not happy," said Benotman, who was in Tripoli when the revolt erupted in mid-February, and who has close contacts with high-level Libyan officials. "The message being delivered is that they have to make a decision now." Kusa is more than just a familiar face to Western leaders. He has fled Libya carrying a wealth of information which could prove extremely valuable to the coalition, as they try to assess how to end the military conflict and get Gaddafi to step down after nearly 42 years in power. As one of Gaddafi's closest aides, Kusa presumably would be informed about Gaddafi's current war plans and his state of mind after 11 days of the coalition's aerial bombing, as well as whether he might be open to negotiating a deal regarding exile for Gaddafi and his family. 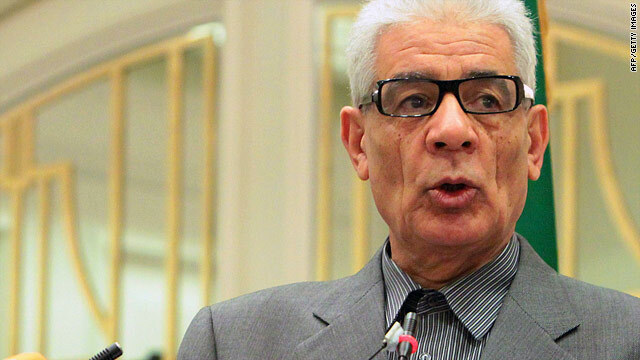 Kusa was a long-standing chief of Libya's intelligence service, before being appointed Foreign Minister in 2009. That means he likely holds critical information which could ultimately lead to international indictments against Gaddafi and his family, including whether the Libyan leader ordered the PanAm jet to be shot down over Lockerbie, Scotland in 1989, an attack which killed 270 people. He might also provide insights and information about more recent events, including the military's decision to shoot unarmed protesters in Benghazi and other towns in eastern Libya in mid-February. Those actions are believed to be the most likely bases for a possible indictment of crimes against humanity, which could be handed down by the prosecutor at the International Criminal Court in The Hague. Britsh Foreign Secretary William Hague said on Thursday that his government would not give Kusa immunity from prosecution. « Previous entryDoes the U.S. really want to own Libya? What I want to know here is just how much did the U.S. government pay this Moussa Kusa to defect. Just like the very rat that he is,he jumped ship for a substantial amount of money. At the same time,the right-wing fanatics are going ballistic here in this country over our huge deficit spending which only goes to show just how two-faced they are!!! Thank you,Onesmallvoice. I couldn't have said it better myself. Nobody outside Libya, except Mr. Kusa himself knows the circumstances of his defection. Therefore one doesn't to what extent his action has done harm to his former master. I can imagine that Kusa has had sleepless nights and will have plenty more ahead of him, as he could be held accountable for the Lockerbie bombing. He could trade for an amnesty with information he knows about his former government. To all of my amercian friends from Europe. I do hope that this time the US stays out of any eventual ground war against Gaddaffi. Not because I want him to remian there but I believe that it's about time that all of the countries that have been used to letting the US do the dirty work to resolve evrybodys problems shoudl start doing there shar of the job. In other words let the Europeons resolve the problem. The Europeons have always taken advantage of the US to let them make their wars, but when the US starts the wars the Europeons suddenly become pacifists, while the US soldiers die. Now it's their turn to prove to take the responsabilty!!! Hold on Obama! Don't throw that Nobel Peace Prize awaya!